Bonnie Parker and Clyde Barrow are perhaps the most famous criminal couple in history. They robbed and hijacked their way to fame…and their death. Hmmm…where to start with this couple?!? Both Bonnie and Clyde dealt with some negative sides of life before they met. Clyde had already been in trouble with the law for burglary and Bonnie had been married to a man who was serving time for murder. The two met in Texas in January of 1930 I believe. The first time Clyde came to see Bonnie he was arrested for burglary and car theft. Bonnie smuggled a gun into the jail for him. He escaped but was captured within a few days and handed a sentence of 14 years. It was here, at Huntsville Prison in Texas, that he committed his first murder. The man he murdered had supposedly sexually assaulted him. He was transferred to Eastham Prison Farm where prisoners were worked extremely hard and beaten. He persuaded a fellow inmate to cut off two of his toes with an axe in hopes of getting out of doing any hard labor. This desperate attempt to get outta hard work and be transferred is the reason he walked with a limp for the remainder of his life. After a short time, Bonnie and Clyde ran off together following his parole in February of 1932 and began their crime spree all across Texas. The robberies they committed were never very large, but they left a ton of rubble along the way. Within a year the couple’s life of crime was well-known. It was at this time they joined up with Clyde’s brother Buck and sister-in-law Blanche. They killed two police officers shooting their way out of an apartment soon after. Bonnie was badly burned on her leg after a car accident and the group had to take shelter with a farmer. The farmer called the police after figuring out who they were. The gang, once again, had to shoot their way out of the situation. Running out of places to hide, the group really started to feel the tension and stress of life on the run. Rumor has it that Blanche began heated arguments amongst the group and Bonnie longed for a more civilized life with no more running from the law. The group was resting at a camp in Iowa when they found themselves once again in a pickle. They were heavily surrounded and a fire fight broke out. Buck was killed and Blanche, blinded in her left eye by shards of glass, was taken into custody. On May 23, 1934 Bonnie and Clyde were driving down Highway 154 in Louisiana. Little did they know that a posse was waiting to ambush them. Clyde slowed his car down to stop and help a broken down motorist, Mr. Methvin (a supposable friend of Bonnie and Clyde). Mr. Methvin had contacted law enforcement and worked out a plan to murder the duo. 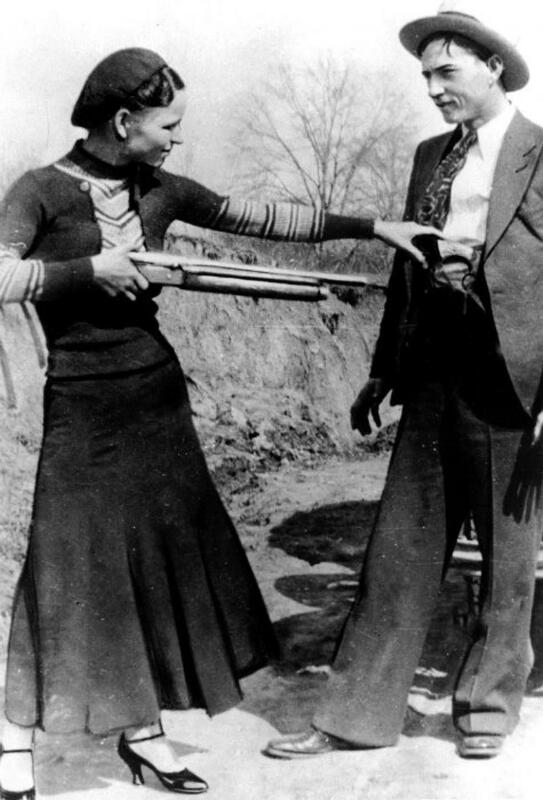 More than 130 bullets rang out striking Bonnie and Clyde. At the time of their death they were accused of 13 murders and several robberies. They had a habit of kidnapping law enforcement officers and driving them around for hours only to release them hundreds of miles away unharmed. A few of the crimes were the murder of two police officers in Joplin, Missouri…kidnapping a man and woman in Louisiana…murder of a man in Hillsboro, Texas…murder of a sheriff in Stringtown, Oklahoma…kidnapping a deputy in New Mexico…and several more. Bonnie and Clyde lived out of their car and never got much money in the robberies. Bonnie wrote poetry that captured the hearts of many! In my opinion, these two were sort of destined to be together. I know that sounds bad but, looking at the history of these two, they were two bad seeds that went together well. Clyde seemed to always be in trouble with the law and Bonnie always went for the bad boy. Their two-year crime spree was bloody and messy but it was also a romantic story of two people who just happen to be going down the wrong road.